The SpectraMax® Glo Steady-Luc™ Reporter Assay Kit provides a highly sensitive assay for the quantitation of firefly luciferase expression in mammalian cells. The assay kit is optimized for Molecular Devices SpectraMax® microplate readers with a preconfigured protocol provided in SoftMax® Pro Software for simplified data acquisition and analysis. 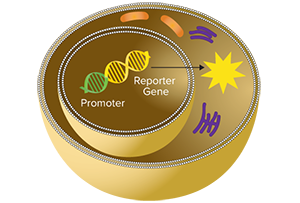 Reporter gene assays are an important tool for biomedical and pharmaceutical researchers to monitor cellular events associated with gene expression, gene regulation, and signal transduction. Firefly luciferase, one of the most commonly used reporters, produces light by catalyzing a bioluminescence reaction that oxidizes D-luciferin in the presence of oxygen and ATP. The application of luciferase-based reporter assay using luminescence microplate readers has become increasing popular for high-throughput analysis of gene expression as well as drug discovery applications. The SpectraMax Glo Steady-Luc Reporter Assay Kit is designed for optimal performance on microplate readers with high throughput enabled by both the microplate format and assay signal stability. Figure 1: Luminescence measurement on the SpectraMax i3/i3x reader. (A) Extended signal stability with signal at 5 hours within 20% of initial value. (B) The wide linear detection range spanning 7 orders of magnitude with lower detection limit at 5 femtograms/well. 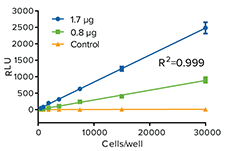 Figure 2: Data show cells correlating linearly with luciferase expression. CHO-K1 cells were transiently transfected with different concentrations of firefly luciferase cDNA with different cell titration measured by the luminescence signal using the SpectraMax Glo Steady-Luc Reporter Assay Kit. Figure 1: Principle of luciferase reporter assay. The firefly luciferase (reporter) gene containing the promoter region of interest (green) is transfected into target cells, and luciferase-expressing cells are lysed before the amount of expressed luciferase protein is measured by the luminescence signal. Figure 2: SpectraMax Glo Steady-Luc Reporter Assay Kit workflow.